Fuel consumption never recorded by seller. He has used the boat at displacement speeds. Engine hours are believed to be close approximations. One engine has slightly higher hours than the other. Four batteries and one spare are about 8 years old. Trojan Boats built approximately 2200 of the 32 Foot Sedans between 1972 and 1992 according to information on their website. Waterline Boats / Boatshed did not independently verify capacities and measurements, which are reported from seller-provided information and/or literature. Entering the center sliding door from the cockpit you are in a modest sized salon with convertible loveseat-sized couch to starboard and two freestanding chairs to port each side with convenient tables. Forward and down is the galley to port and a table with seating for four to starboard. A head with shower and basin are to port and a "V" berth style forward cabin has a nice foam mattress and some storage. Between the table and the forward cabin is a wall with door access for a flat screen TV to be viewed from either inside the forward cabin or sitting at the table depending on how you move the mount. The interior has very nice furnishings, both clean and attractive. Chain appears in good condition. Seller reports it was seldom used as they preferred staying at docks with shore power. Windlass is electric up only and appeared as un-branded Maxwell style. Limited Navigation electronics appear as original to the boat. Compass at top and lower helms. Owners and surveyors have many good things to say about the quality of build on the F-32 Trojan. When comparing to other brands the Trojan is considered a heavily built boat. This particular vessel shows good care with a clean interior and engine room. It would benefit from some upgrades to the nav electronics. The engines started right up without smoke and ran smoothly. This would make an excellent starter boat for anyone looking to keep their costs in the $20s and still get a boat capable of vacationing a family. This is a fresh water kept vessel. 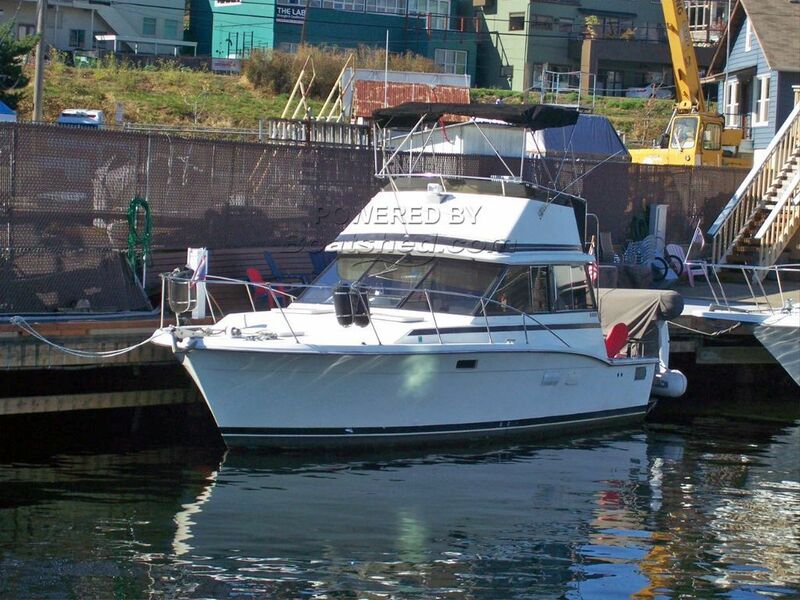 This Trojan F-32 Flybridge has been personally photographed and viewed by Gary Buck of Boatshed Seattle. Click here for contact details.